At 2 am this Morning rainfall across Oman looked like this. At 10 pm last night after a meeting, the committee declared that the direct effects of the tropical storm were over. We're thankful always to those from the Emergency services who've worked tirelessly to rescue and help people during Mekunu and continue to look after the safety of citizens, residents of Oman. Wind speeds are now down to 17-27 knots. SalamAir also will resume flights tomorrow. It's been announced that Salalah airport will reopen from 12 am the 27th May. Also, Oman Air has announced that flights to and from Salalah will resume. The Tropical Cyclone Mekunu's intensity has dropped with wind speeds of 28-33 knots at 12 pm. It was announced ten minutes ago (4.40pm) that wind speeds have dropped yet again and were now around 20 to 25 knots. 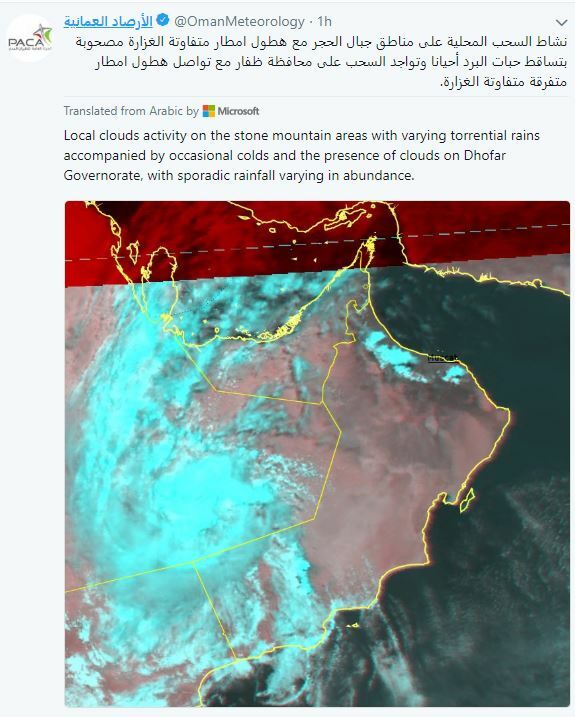 The Royal Oman Police advise citizens and residents to stay indoors still. The civil defence has been working continuously over the last 24hrs to help people in Salalah and the surrounding areas and the rescues continue. 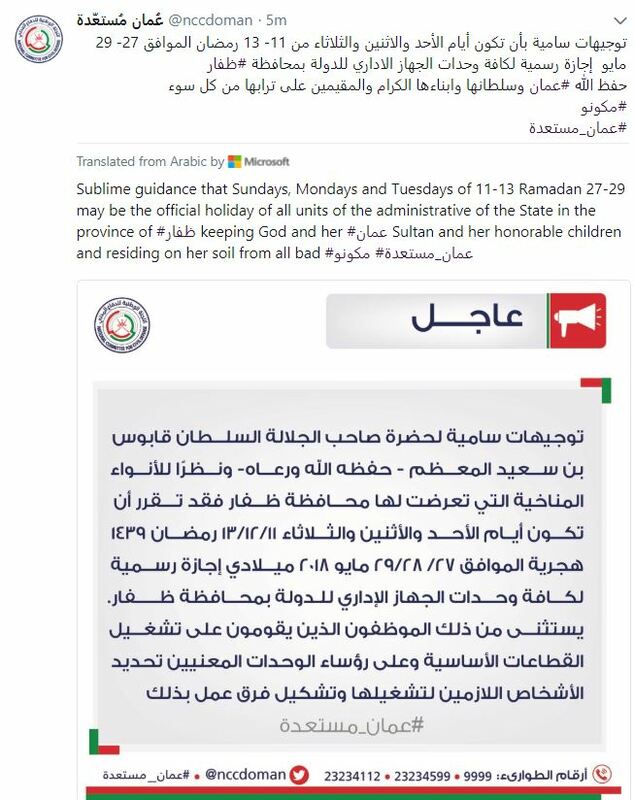 Oman declares a public holiday on 27-29th May in Dhofar due to Mekunu, Oman News Agency has reported. The holiday comes as a direction from Sultan Qaboos bin Said as the southern governorate continues to deal with the aftermath of Mekunu. 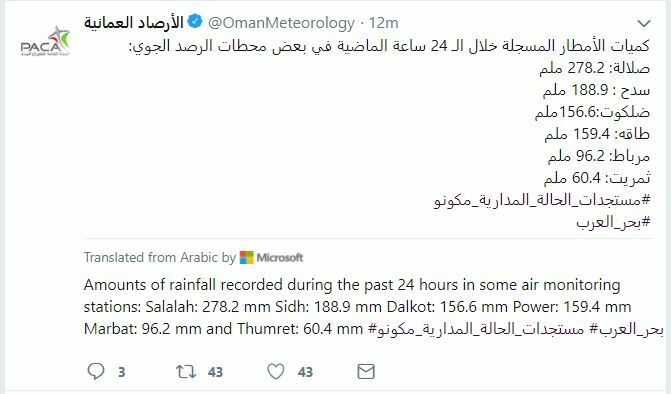 Well over 200mm of rain has fallen on Salalah over the last 24hrs causing flash floods. Cyclone Mekunu weakens to a Category One cyclone. Two Indian navy ships have set sail from India to Oman, to help with relief and rescue work as stated in the tweet below. Parts of Salalah & Dhofar have received extremely heavy rainfall as Cyclone Mekunu approaches. Salalah airport with remain closed for another 24hrs it has been announced. 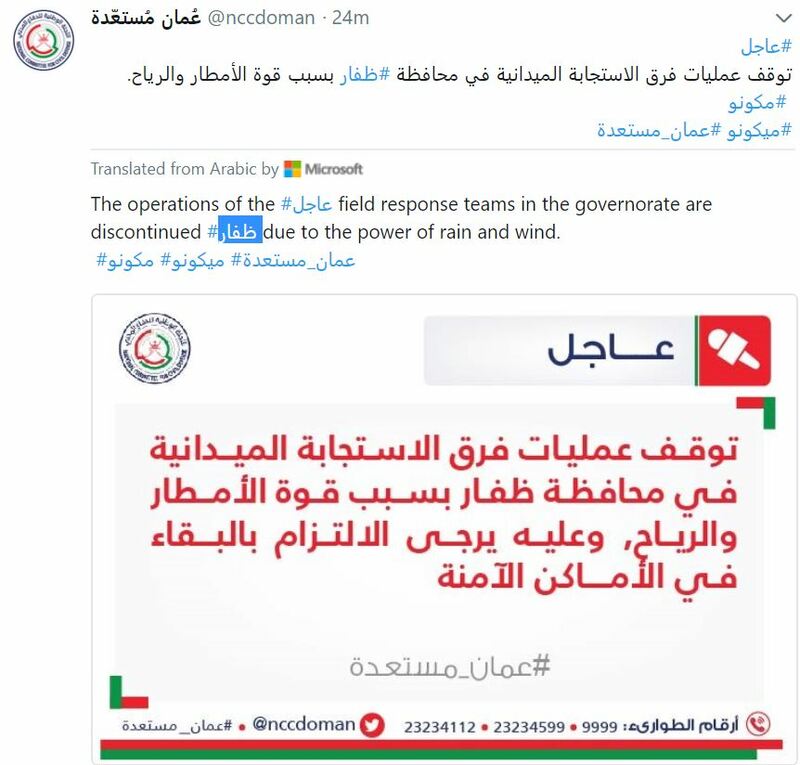 Operations of the field response teams have been brought to a halt right now due to strong winds and heavy rainfall, Oman’s National Emergency Management Centre announced on Twitter. Reports of isolated showers now falling in Muscat. Heavy rain is now falling in Salalah, Shalim and the islands of Hallaniyat. There's heavy rain and high winds in Sadah and Joufa and widespread power cuts in the area of Shreshti and Wardit. Oman Meteorology has announced the total amount of rainfall over the last 24 hours. If you need help during Cyclone Mekunu, Oman's National Committee for Civil Defence has released a list of emergency numbers. The police are closing the Sea street in the Soukara area of the state in #الجازر anticipation of any landslides caused by the rains. Follow PACA on TWITTER HERE for more updates. The surface winds are blowing at speeds between 70 to 80 knots (130 to 148 Km/h). During #cycloneMekunu SMS is free for all Ooredoo customers to any network from 11pm tonight until further notice. 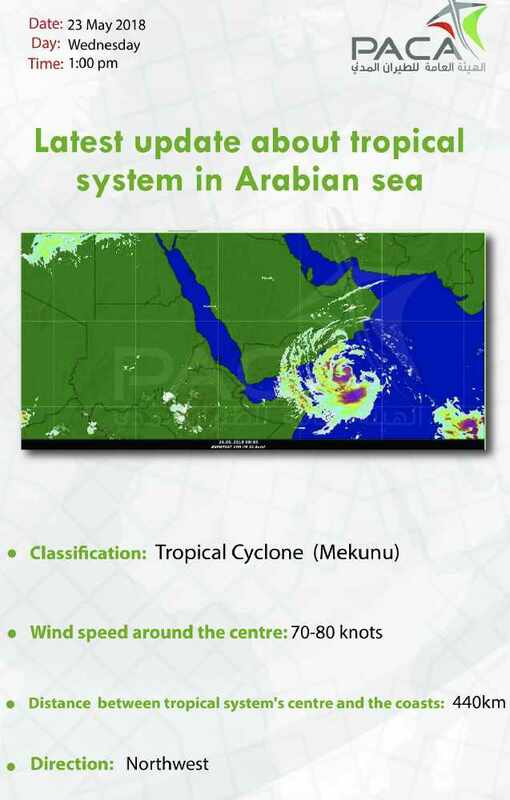 The centre of Cyclone Mekunu is about 450km from Al Mahra coasts with chances of heavy rain, gale wind, and high waves that about 5-7 meters. 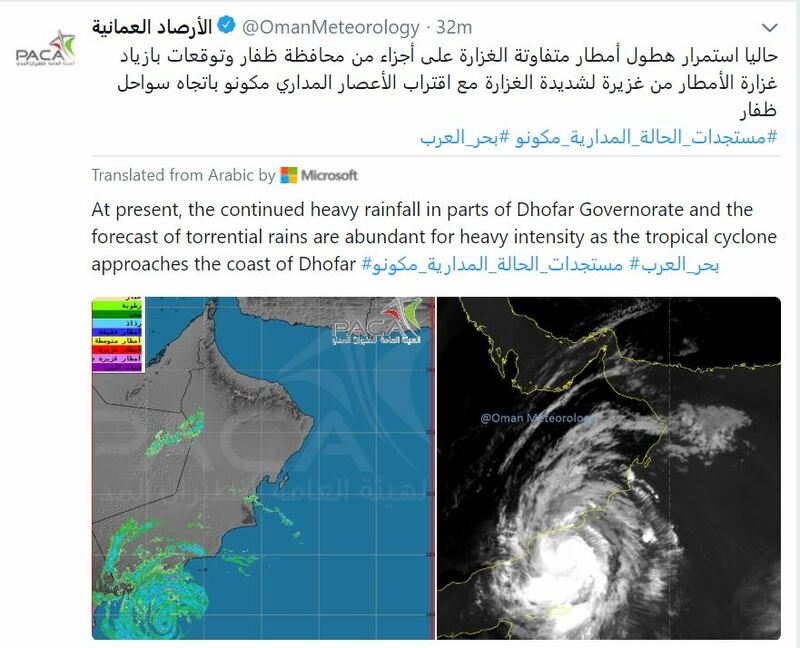 Residents of Dahariz and Hafah coasts in the wilayat of Salalah have been evacuated due to a high level of water, according to Oman’s National Emergency Management Centre (ONEHC). Rakhyut Hospital has also been closed. Salalah Airport will close at Midnight for 24 hours. Check with your airline for further details. 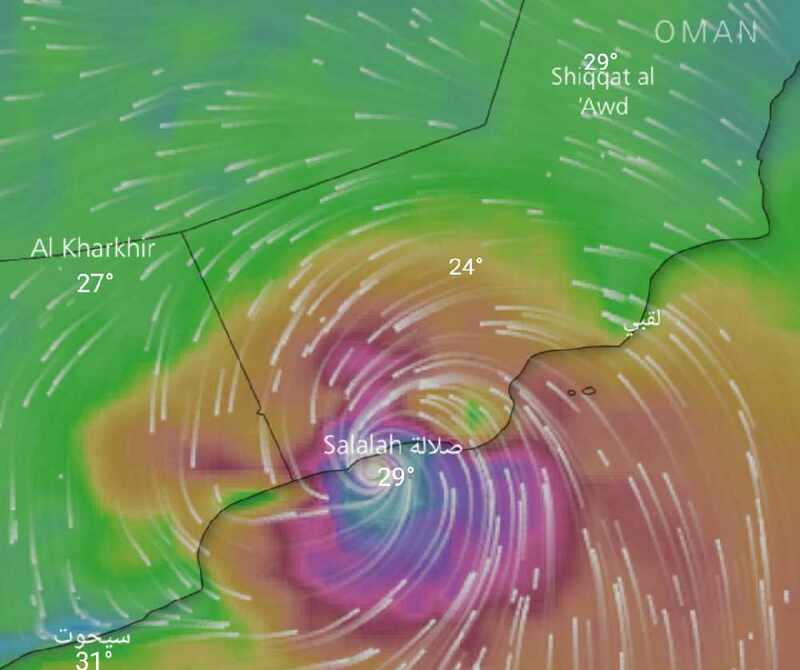 Cyclone Mekunu is now located 400km away from Salalah. It is expected to turn into a category 2 cyclone within the next 12 hours. Cyclone Mekunu hit Yemeni island Socotra late on Wednesday night and is now heading towards Oman. Yemen high commission declared Socotra as a disaster zone. Seven people were declared missing and hundreds were evacuated from their homes after Cyclone Mekunu hit. Two ships have also been reported as missing in the area. 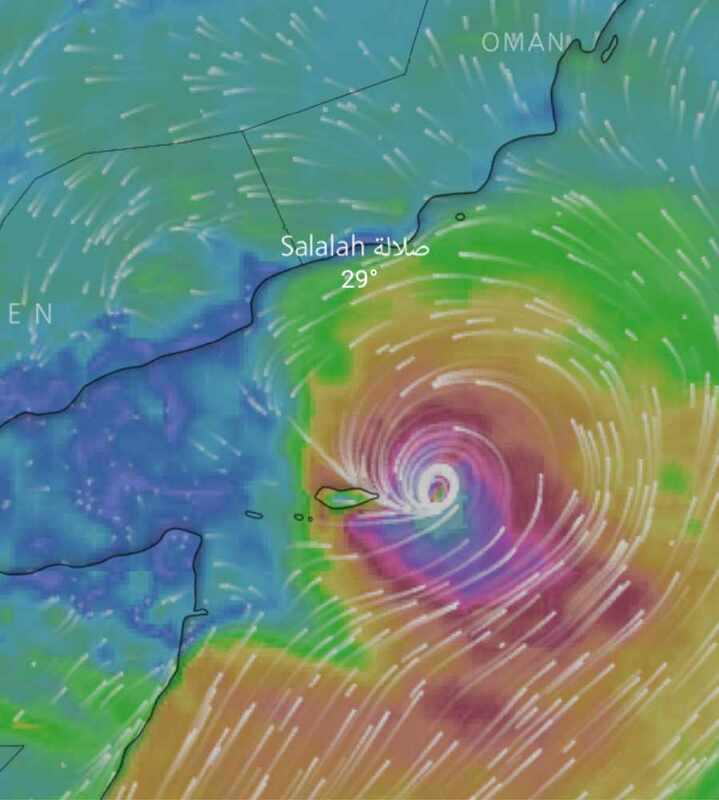 #Socotra archipelago in #Yemen struggles again with #CycloneMekunu - Winds at a 100 miles per hour producing flash floods and mudslides. Video from today, May 23, 2018. 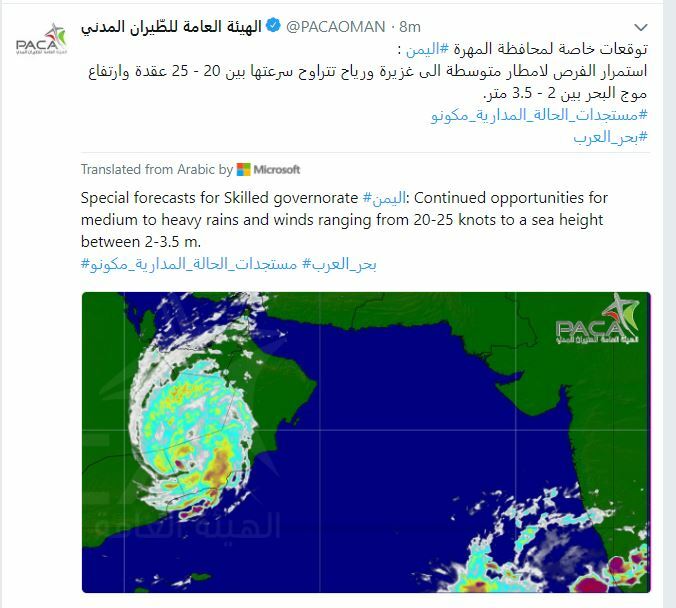 The latest from the Public Authority for Civil Aviation (PACA) has said that Cyclone Mekunu's storm clouds are 40 km away from the Wilayat of Sadah, Dhofar. 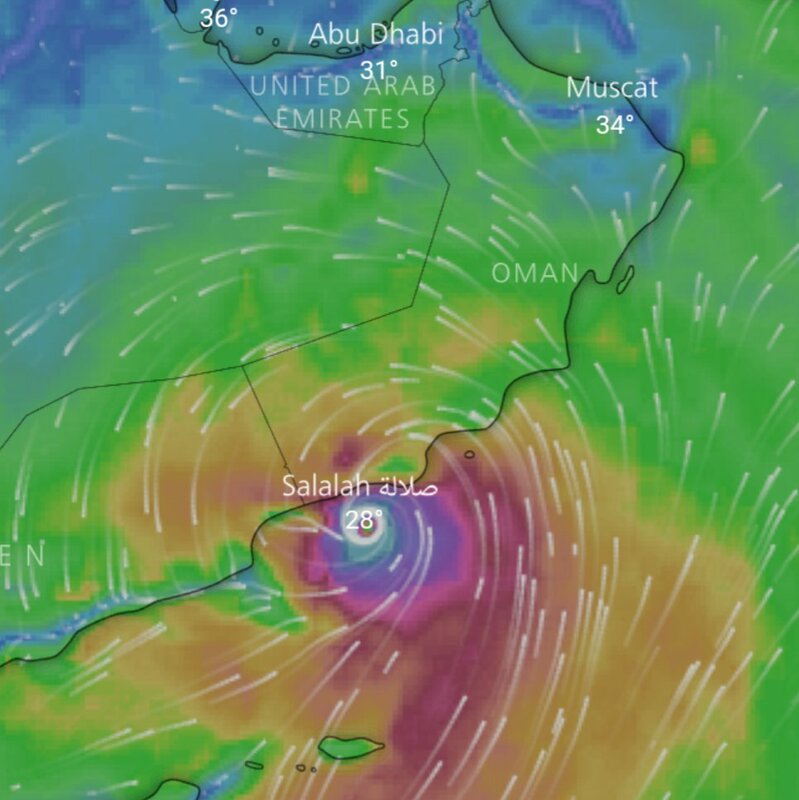 The cyclone is expected to hit Dhofar and Al Wusta coasts on Friday. The public has been urged not to go near wadis or low lying areas. It is expected to turn into a high-intensity category 2 cyclone within the next 24 hours. Sultan Qaboos Hospital in Salalah is evacuating all patients, critical cases and dialysis patients are currently being transferred by the Royal Air Force, the Ministry of Health announced. •ندعو المواطنين والمقيمين إلى الانتقال من المناطق المنخفضة إلى مناطق أكثر أمنًا. •الشرطة تنشر مزيدا من أفرادها في المناطق الأكثر توقعا بالإعصار. 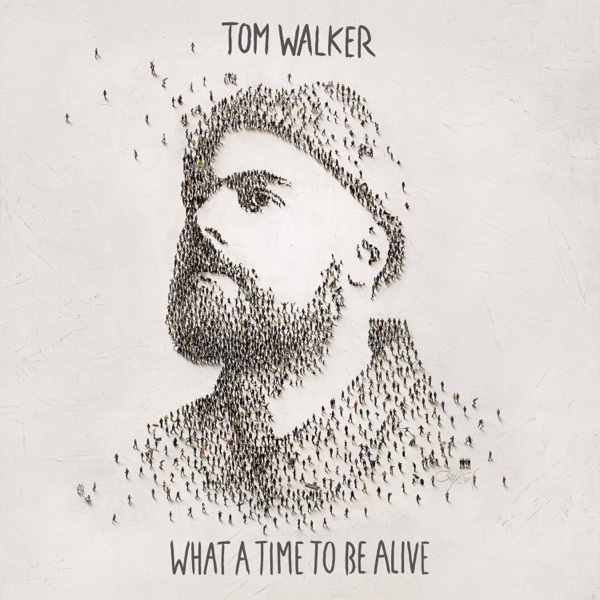 Updated: 22:00 - Wednesday 23rd May. Cyclone Mekunu is expected to intensify into a Category Two cyclone within the next 36 hours and will make landfall in southern Oman tomorrow (Thursday). 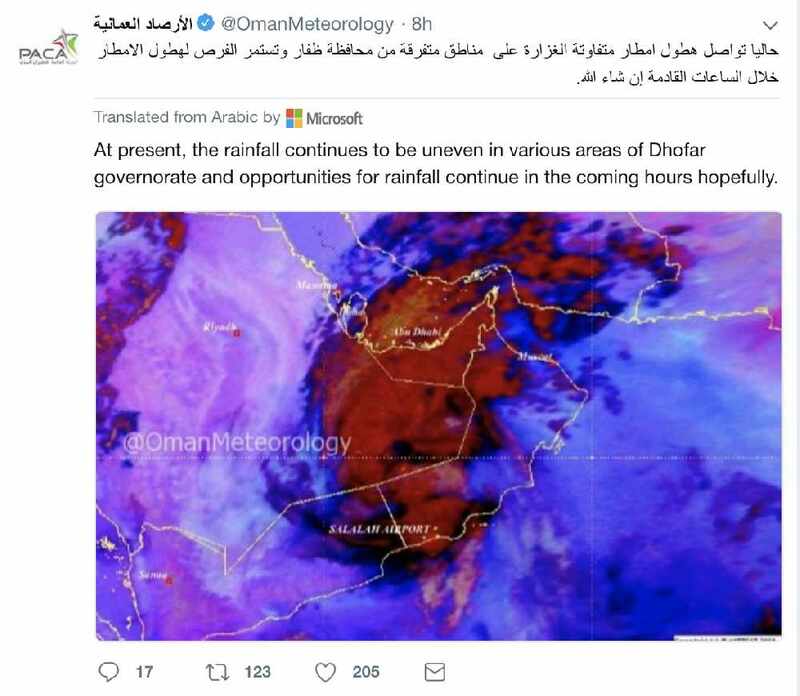 Dhofar Governorate is expected to be severely affected by the storm, and surrounding areas could also experience heavy rain, thunderstorms and strong winds of up to 135kph. Public Authority for Civil Aviation has urged everyone to stay away from the coastline and wadis. Evacuations of the Helaniyat Islands has already begun. and is likely to make a landfall in southern Oman and northern Yemen on Thursday.